Choose one of the above dates and spend an evening making up to 20 cards, using the fabulous Happiness Blooms Memories & More Card Pack and Memories & More Cards & Envelopes from Stampin’ Up! 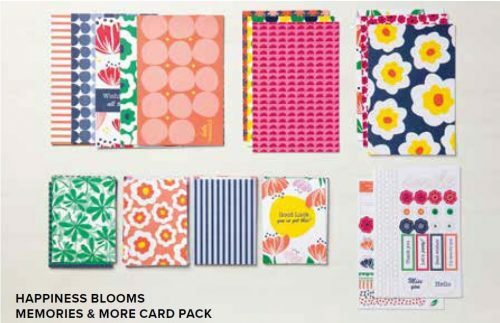 The Happiness Blooms Memories & More Card Pack contains 50 double-sided cards (2 each of 25 designs) two different sizes, 6 single-sided speciality cards and 4 sticker sheets. 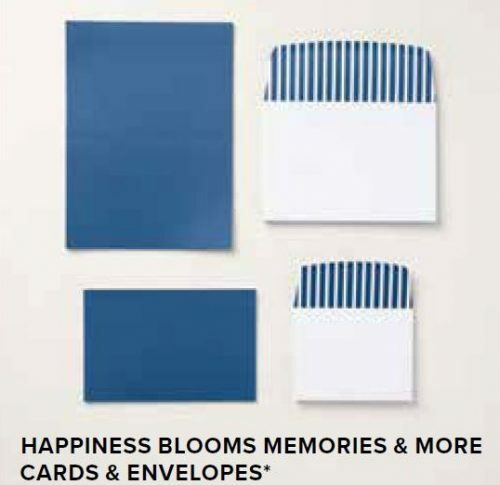 Memories & More Cards & Envelopes (pack of 20 Night of Navy cards in 2 sizes & envelopes) have been designed to co-ordinate with the Memories & More Card Pack. All you need to do is put them together however you choose, adding Stampin’ Dimensionals, Baker’s Twine and Rhinestones from your class kit as needed. Let your imagination run wild*. – As much or little tuition as you require. – A hot drink and piece of cake (additional refreshments are available to purchase). Book your place by Tuesday 19th February (for class on Tues 12th March). Book your place by Wednesday 6th March (for class on Weds 27th March). Part-payment of £10 is required by booking close date. Remaining balance is required 2 weeks prior to class date.